If you have a Kinect, you can use a variety of voice commands with your Xbox One that turn it on, navigate the interface, skype your friends, and even record your gameplay. 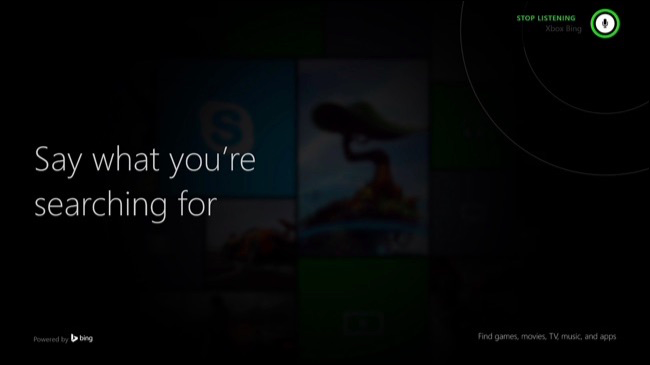 Unlike Cortana, the Xbox One requires specific commands–you can’t just talk to your Xbox using natural speech. Voice commands also require a Kinect. You can’t simply issue voice commands through a standard headset, as you can with a PlayStation 4. If you have a Kinect, though, and you’re willing to learn a few specific commands, they can be pretty useful. RELATED: How Much Does the Xbox One’s “Energy Saving” Mode Really Save? All commands begin with the word “Xbox.” This activates the Kinect, which starts listening for the rest of your command. If you just say “Xbox” without saying an additional command, you’ll see a screen suggesting a few basic commands to get started. Xbox, On: This is the only command that works while your Xbox One is off. It must be in Instant On mode and the Kinect must be plugged in. If both of these are true, you can just say “Xbox, On” to turn your Xbox One on. Xbox: If you just say “Xbox” without saying an additional command, you’ll see a screen suggesting a few basic commands to get started. More Shortcuts: Say “More shortcuts” on the screen that appears after you say “Xbox” and you’ll see a more complete list of voice commands you can use. This is a good quick reference if you ever need a refresher. Stop Listening: While your Xbox is already listening, you can say “Stop Listening” and it will stop listening for commands. Xbox, Select: Say “Xbox, Select” to see a list of contextual voice commands that work on the current screen. Some options in the current screen will then be highlighted in green. You can say the name of an option to activate it. 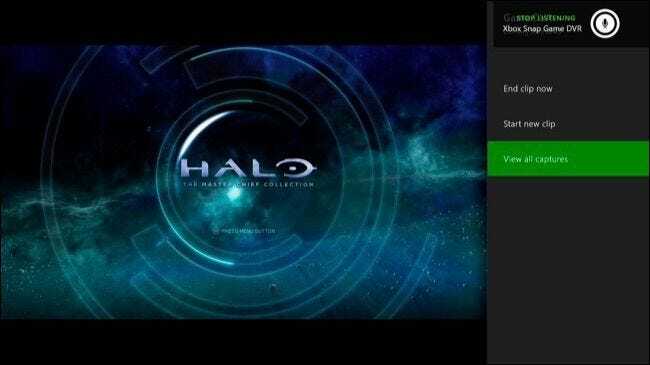 For example, in the screenshot below, you can say “Home” to go to the home tab, “Resume Halo: The Master Chief Collection” to resume playing the game, or “Page down” to go down a page, among other commands. 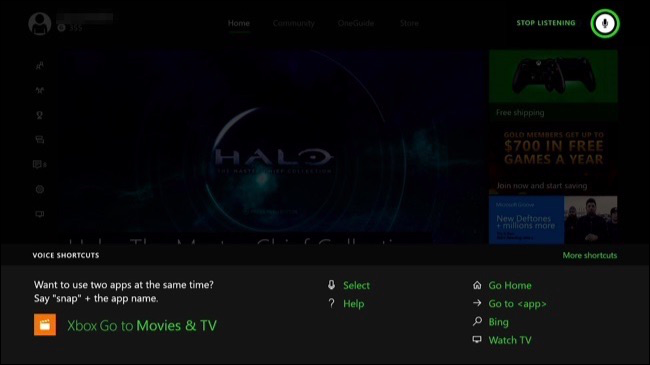 If your Xbox stops listening, you’ll have to say “Xbox” or “Xbox, Select” before saying a command that appears on the current screen. Xbox, Go Home: Go to the Xbox dashboard. Xbox, Show Menu: Open the context menu. 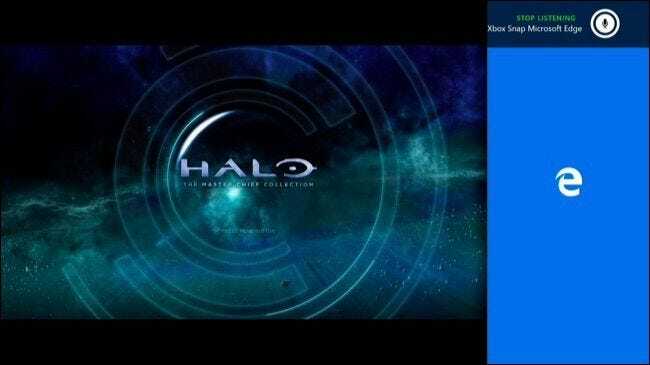 Xbox, Go Back: Go back to the previous screen. Xbox, Show Notifications: Open the notification panel. Xbox, Help: Open the Help application. Xbox, Bing [Search]: Search Bing for whatever you say. Xbox, Use a Code: Open the Kinect camera so you can hold up a QR code. These are often used to redeem content on the Xbox store. Xbox, Turn Off: Turn off the Xbox One. It will go into either Instant On mode or Power Saving mode, depending on how you’ve set it up. These commands allow you to launch and snap games and apps. Snap allows you to multitask. Xbox, Go to [Name of Game or App]: Launches the game or app you specify. Xbox, Snap [Name of App]: Snap the app you specify to the right side of your screen. Xbox, Switch: Switch focus between the main app and the snapped app. Xbox, Unsnap: Remove the snapped app from the side of your screen. 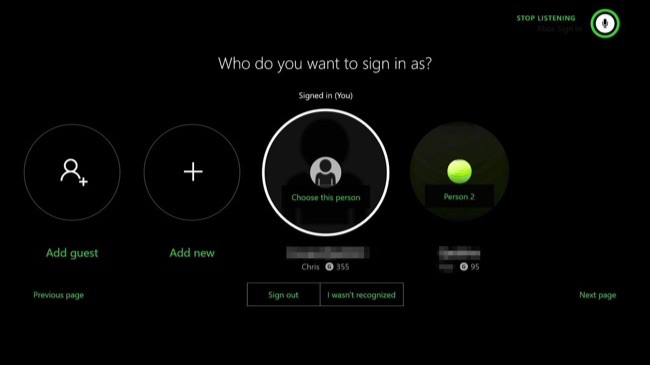 Xbox, Sign In: Open the “Who do you want to sign in as?” screen so you can sign in as an existing user or add a new user. Xbox, Sign Out: Sign out of your Xbox One. Xbox, Sign In As [Name]: Sign in as the person you choose. Xbox, Record That: Save the last 30 seconds of your gameplay to your Xbox One. Xbox, Take a Screenshot: Capture a screenshot of the gameplay. Xbox, Snap Game DVR: Snap the Game DVR app to the side of your screen, giving you more options for recording your gameplay. Xbox, Broadcast: Broadcast your gameplay on Twitch. Xbox, Skype [Name] or Xbox, Call [Name]: Start a Skype call with the person you specify. Xbox, Answer: Answer an incoming Skype call with video. Xbox, Answer Without Video: Answer an incoming Skype call without video. Xbox, Hang Up: Hang up a Skype call. 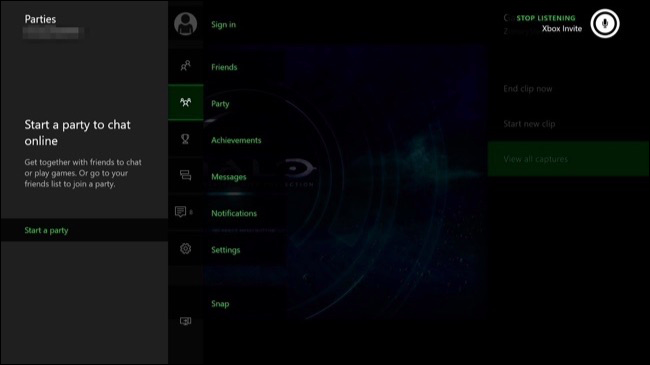 Xbox, Invite: Open the Party panel so you can form a party to play games with your friends. The Xbox offers a long list of voice commands for controlling video and music playback. These work across the entire Xbox experience, including in apps like Netflix. Xbox, Fast Forward: Fast forward. Xbox, Faster: Increase the playback speed. Xbox, Slower: Decrease the playback speed. Xbox, Skip Forward: Skip forward in the current music or video. Xbox, Skip Backward: Skip backward in the current music or video . Xbox, Next Song: Go to the next song. Xbox, Previous Song: Go to the previous song. 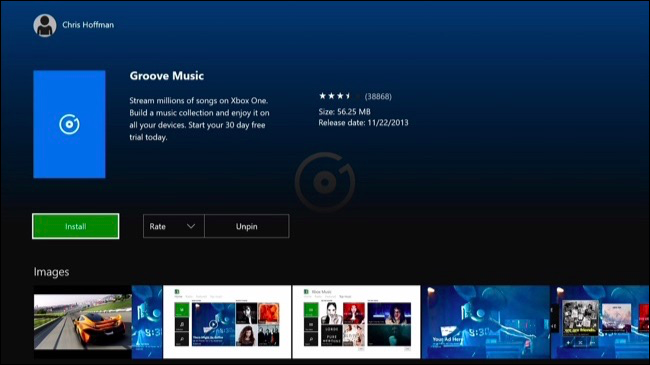 Xbox, Play Music: Open the Groove Music app to start playing music. You’ll be prompted to download the Groove Music app if you haven’t already. These options will only work if you’ve set up your Xbox to communicate with your TV through Kinect or a separate IR blaster. To do so, open the OneGuide app and go through the setup process. Xbox, Volume Up: Increase TV volume. Xbox, Volume Down: Decrease TV volume. Xbox, Mute: Mute your TV. Xbox, Unmute: Unmute your TV. 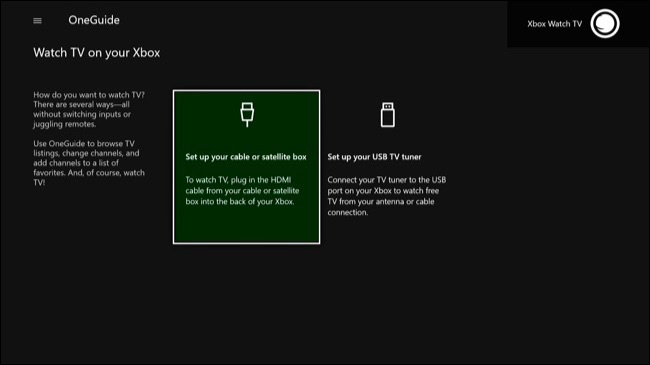 These options will only work if you’ve set up your Xbox One to watch TV from a cable box, satellite box, or USB TV tuner. Open the OneGuide app to set this up. 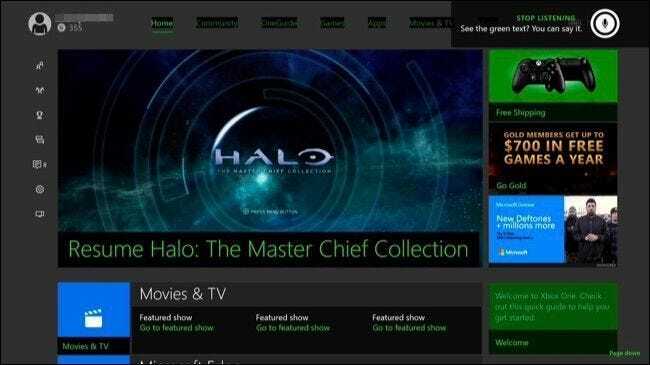 Xbox, Watch TV or Xbox, Go to OneGuide: Open the OneGuide app, allowing you to watch TV if you’ve set that up. Xbox, Watch [Channel Name]: Open the OneGuide app and tune it to the channel you specify. While these voice commands require a Kinect, Microsoft is working on Cortana integration that should be released at some point in 2016. Cortana will work with a headset as well as a Kinect, giving more Xbox One users access to voice controls.